The naïve and impressionable daughter of Lord and Lady Groan, Fuchsia is lonely and starved for attention when Steerpike drops into her attic and passes himself off as an adventurer. Fueling her fantasies, he becomes her servant and seducer. As Steerpike rises to power, Fuchsia's infatuation with him grows, leading her to a tragic end. 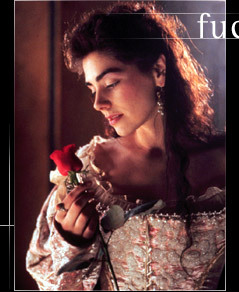 Scottish actress Neve McIntosh believes that Fuchsia is Gormenghast's damsel in distress. "She locks herself in her attic where she lives in her imagination. All she wants is a knight in shining armor to come up to the castle tower and carry her off." But when that knight turns up in the form of Steerpike, she does not get the savior she pined for. McIntosh spent long hours in the makeup department before each filming day. "It does help having to squeeze yourself into these very restrictive costumes. I had to wear stiff collars that she gets buttoned into for ceremonials. That helps to play that rigidity," she says, though she admits she breathed a sigh of relief when the corset was removed for the last time. Since leaving drama school five years ago, McIntosh's career has progressed steadily. Her breakthrough came on the BBC's Psychos, also directed by Andy Wilson. She has also appeared in Lady Audley's Secret on PBS's Mystery! ... a girl of about fifteen with long, rather wild black hair. She was gauche in movement and in a sense ugly of face, but with how small a twist might she not suddenly have become beautiful. Her sullen mouth was full and rich -- her eyes smoldered. A yellow scarf hung loosely around her neck. Her shapeless dress was flaming red. For all the straightness of her back, she walked with a slouch.